History Rock is named after a boulder next to the hiking trail where locals etched their name over the last century. History Rock Trail is interesting for flowers that like wet feet near the beginning of the trailhead and flowers that find shelter in pine forests and meadows as you ascend the mountain. This is a good trail to try when the temperature is in the 90’s in Bozeman and you are looking for a little shelter at higher elevations. There trail starts at 6500 ft. elevation and steadily climbs 300 feet to the History Rock outcropping. Few-flowered shooting stars (Dodecatheon pulchellum) grow in abundance near the creek that borders the trail for the first few hundred feet. Elephanthead (Pedicularis grownlandica) has tiny flowers that bear a closer look—densely arranged along its racemes are purplish-pink blossoms that resemble elephant heads with big drooping ears and a long trunk. They are growing in the bog to the right of the trail before you enter the meadow. The long leaves have a fernlike appearance as they are narrow and pinnately divided. This interesting flower can be found any time in late June to mid-July depending on the year. White bog-orchids (Habenaria dilatata), tall bluebells (Mertensia paniculata), and white (Richardson’s) geranium (Geranium richardsonii) join the march of the elephants across the soggy ground until you enter the forest. The trail takes off through the beautiful meadow for about ¼ mile before entering the woods where the climb really begins. 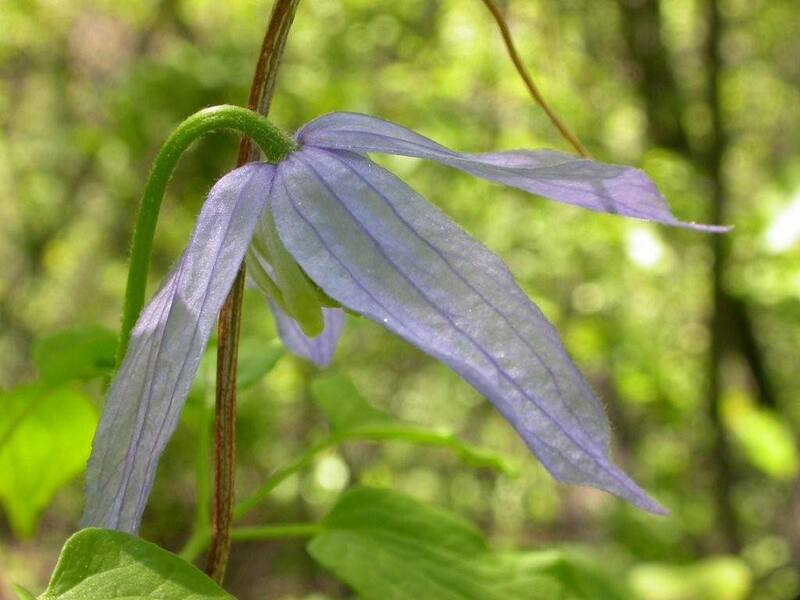 The trail ascends moderately with no “downs.” Watch for flowers like sticky geraniums (Geranium viscosissimum) or prairie coneflowers (Ratibida columnifera) appearing occasionally in open areas or blue clematis (rock clematis) (Clematis columbiana) draped on the bushes. There you can look for spotted coralroot (Corallorhiza maculata), striped coralroot (Corallorhiza striata), and western coralroot (Corallorhiza mertensiana). They all are most often found standing in a spot of sunlight near or on decaying humus. They all lack chlorophyll, are red-brown in color, and are members of the orchid family. A particular favorite of ours is the fairy slipper (Calypso bulbosa). These 2–6 inch tall flowers are a rare find and should be left undisturbed. We do not see these little pink dancing orchids often and they can be difficult to spot. They prefer cool, moist, deep shaded, north-facing slopes. We find them hidden under huckleberry bushes or tucked behind logs. The Sypes Canyon Trail in the Bridger Range is another location where they seem to have a small colony. On History Rock Trail, watch for them across the trail from the meadow just before the History Rock outcropping. There are few other flowers in the forest early in the season, but twinflowers (Linnaea borealis) will be blooming in late July as well as Prince’s Pine (Pipsissewa) (Chimaphila umbellate), a low evergreen semi-shrub with pink flowers that grow in a kind of umbrella shape. Once you pass the impressive rock that is covered with names carved into it from as far back as the early 1900’s, you will pass in and out of meadows that are often thick with tall bluebells and at about two miles come to the Hyalite Divide Trail. The snow is slow to leave at the top of the divide (8016 ft. elevation) as we saw on our hike July 3, 2006. Drifts remained that were 2–3 feet deep. A left turn will take you to a meadow with great views of the Gallatin Range. A right turn takes you on the Divide Trail 2½ miles following Fox Creek to South Cottonwood Creek Trail. Directions: From downtown Bozeman (Main Street and 19th Avenue), travel south on 19th Avenue seven (7) miles to Hyalite Canyon Road. Turn left and continue 8.8 miles to the History Rock trailhead turnoff on the right, one mile before Hyalite Reservoir. Turn right and park 100 feet ahead in the trailhead parking area. Photos on this page (Top to Bottom): Few-flowered shooting star, Elephanthead, Prince’s Pine (Pipsissewa), Blue clematis (rock clematis) Click to enlarge. Looking for flowers on the History Rock Trail is like an Easter egg hunt. You may only find one example of a particular flower or you may find fields of the same species. Today the meadows were in full bloom, some early flowers were about over in the lower elevations (baldhead waterleaf, glacier lilies, Oregon grape, sugar bowl), and the higher we went the farther back in time we went and saw more of the “early” flowers. Following is a partial list of what we saw: Bog orchids, fleabane, prairiesmoke, Richardson’s geranium, yarrow, elephanthead, cinquefoil spp., sticky geranium, short styled onion, bluebells, groundsel, Indian paintbrush, prairie coneflower, tall larkspur, cow parsnip, narrow-leaf collomia, bladder campion, white clover, yampah, pipsissawa, pink wintergreen (pyrola), one-sided wintergreen (sidebells pyrola), grouse whortleberry, heartleaf arnica, twinflowers, Woods (wild) rose, northern bedstraw, many-flowered stickseed, pussypaws., common pearlyeverlasting, western coralroot, false Solomon seal, orange agoseris, spotted coralroot, western anemone, heal-all (seafheal), thimbleberry, yellow columbine, pinedrops, lupine spp., willow-herb, Rocky Mountain iris, Brook’s saxifrage, parrot-beaked lousewort, twisted stalk, baneberry, horsemint, star-flowered Solomon’s seal, blue violets, blue penstamen, spirea, strawberry, silver leaf phacelia, harebells, clematis, green gentian, wood nymph.